Fishing has always been a major part of our camping experience. Its something that’s always weighed in when planning our route and usually sits as a pretty high priority. One thing that I’m sure other anglers can relate to when camping in the backcountry is tackle condensing. When on a weekend trip at a cottage its really easy to take ALL your tackle and choose what you’ll use once you’re there. This is a luxury that isn’t realistic when you have to portage and are constantly on the move in a canoe. This is something I’ve always struggled with. Growing up a bass angler, I have every lure for every condition in 3 different colours…its insane! If I didn’t spend my savings growing up on lures I may have already had enough to put a down payment on a house….okay, a bit of an exaggeration, but you can believe I have too much tackle for my own good. So I write this to you from my own experience and heartache over the years trying to dial in my tackle game on interior camping trips. 1) Target a species- The easiest way to lighten your load is to figure out what species your route offers. With this you can instantly reduce a large portion of your tackle and still sleep well at night knowing you’ll still have the appropriate hardware. For example, if you’re in a northern Ontario lake leave your duffle bag of largemouth soft plastics at home, they wont do you any good up there. 2) Bread-and-Butter Baits- This is something that I still seem to forget. Although fishing is a big part of the trip, its sometimes shadowed by the fact you have to make distance to reach your campsite each night. Unlike a weekend trip to the cottage, you wont be able to sit on a weed flat all day trying a grocery-list of different coloured jerks, cranks, spoons, jigs and plastics to figure out the perfect lure for the fish species you’re targeting. Realistically you’re going to be casting a single lure as you paddle from point A to point B. So in this case, pick a couple lures you know have a history of producing results and stick with them. If your line stays wet and you have confidence in your lure, you’ll most likely pull out a few fish on the way. 3) Rod Selection- Rods that can break down will save you plenty of headaches when portaging and loading the canoe. 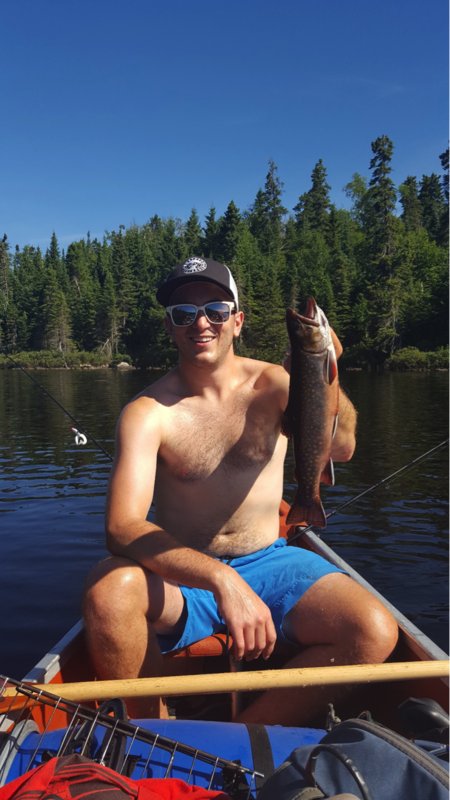 A rod I recommend is a 6.6 medium-heavy action spinning rod because the size and stiffness is pretty versatile for fishing any Ontario river and lake system. A rod doesn’t need to be 300 dollars either, most of the rods I own are less than 100 and they have done a great job for me. A brand I recommend is a Shakespear Ugly Stik, these guys can be broken down in fours or twos, are very durable, cheap and have great warranty. 4) Plan-B- We’ve all been there…you’re using a lure that has been on fire all week and all of a sudden you’re snagged on a log 20’ deep or a snot rocket slashes and cuts you off. Lures that you’re going into the trip with that you have a lot of confidence in, bring an extra or two, it really wont take up much room and it may save you from having a sad moment. A rule of thumb, ALWAYS bring a back-up spoon. This lure has been a staple for years and can catch you multiple species. Don’t be a rookie and go into the backcountry with one Little Cleo, break the bank and by a back-up. When I’m packing for a trip these are the rules I follow and it helps me keep in line and not go too crazy with the tackle. Another rule of thumb is that I try to fit all my tackle into one Tupperware container, this also restricts me from bringing all of Bass Pro Shop.